Abstract | Museums are being affected by the proliferation of mobile technologies equipped with Internet access and location media. Although 80% of visitors own a smartphone only a small number of exhibitions are taking advantage of this situation by engaging visitors with apps designed and conceived for a digital and physical exhibition experience. So far most of mobile apps for museums exhibitions have been designed for giving to the visitor additional information of physical objects, increasing the amount of data and information that the visitor already has, but without taking benefit of all its possibilities. We have identified a few projects that break with this design tradition setting the focus at the interception of play and content, visitor roles and storytelling. A lack of academic literature to analyse and design this kind of experiences was also noticed. The design of apps for museums exhibitions offers a great opportunity to create new relations among museum discourse, visitors, space, and cultural content. Heritage institutions can offer new approaches to cultural experience by expanding the reception of cultural heritage with digital mobile technologies, creating new patterns of cross-media consumption. Although the strategy of using participatory engagement for learning has been a major topic for museums and cultural dissemination (Simon 2010), a recent research trend (Deterding 2011, Nicholson 2012) defines video game elements as a good strategy for learning in non-game context. 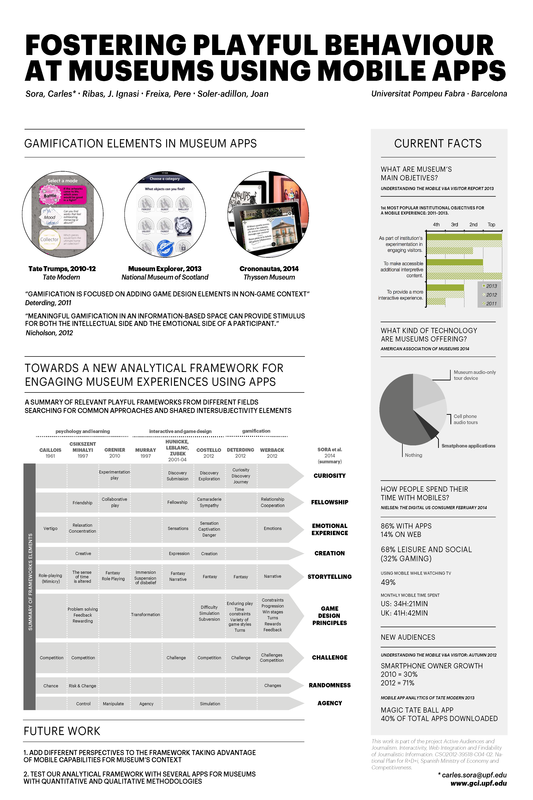 The goal of our framework is to offer a first review of the gamification concepts applied to museums context and mobility, expanding and confront it with other theories. Our frame elements may be useful to analyse and design playful interactive experiences as strategy for offering engaging experiences in museums. Exhibition's apps based on storytelling, play, cooperation and creativity.